DJ Hero was released on the Nintendo Wii, Xbox 360, PlayStation 3, and the PlayStation 2, on October 27, 2009. The game and turntable unit was developed/published by FreeStyleGames and Activision, and I believe the basic DJ Hero Turntable bundle released with a MSRP/List Price of $119.99. The game has seen a price-drop from its originally MSRP, and now has a list price of $69.99 at most retailers. While DJ Hero released with the main bundle around $119.99, Activision did offer a "Renegade Edition" for $199.99. DJ Hero 2 was released yesterday, and the sequel was released on just the PS3, Wii, and Xbox 360 this year. If you already own the turntable from the original game, you can purchase just the software for DJ Hero 2 for $59.99. Or, if you purchase DJ Hero 2, you can purchase just the software for the original DJ Hero. The play-time data shown below, is only for the Wii version of DJ Hero, and it reflects play-time reported in the United States of America, not all of North America. 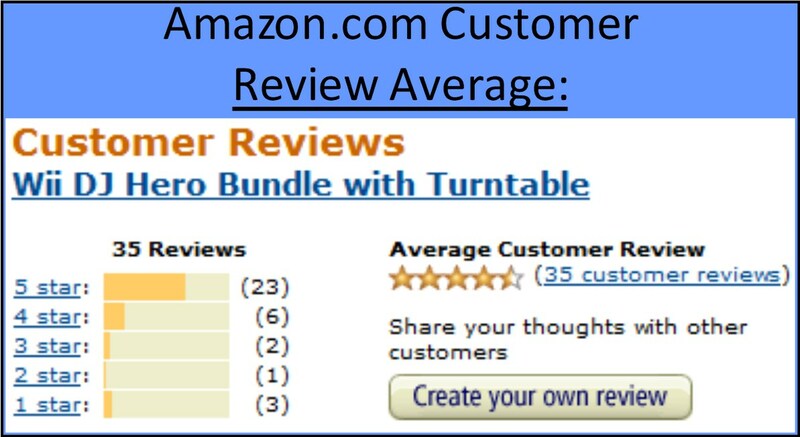 So, with 357 days of game-play data reported since DJ Hero released, how much have Wii owners been spinning and scratching their DJ Hero turntables? Let's take a look! DJ Hero has 35,156 Wii owners reporting play-time data, through the Wii's Nintendo Channel. DJ Hero has 513,243 Total Hours of game-play reported. Its average play-time per session is just over 1 Hour 37 Minutes. The original DJ Hero Turntable bundle's Amazon.com sale rank is #845, and is selling for $66.98. The Wii version of DJ Hero has a review score average of 85.94%, based on 18 "professional" reviews. 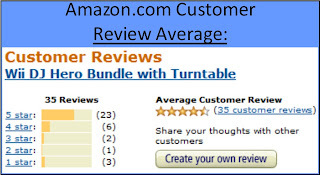 DJ Hero has a 4.5 out of 5 Star rating on Amazon.com, based on 35 customer reviews. I did not purchase the originally DJ Hero, but I did briefly play a demo Best Buy had setup. Mrs. Coffee and I had gone to Best Buy, looking for a CD. We saw the DJ Hero demo setup, and she actually gave it a spin(haha!). It took her about one round to get used to the controls, and she did pretty well in her second round. I played one or two rounds after she did, but that has been the extent of my DJ Hero play-time. I think DJ Hero is a game that shows Activision was willing to gamble with something new. While the original DJ Hero got off to a slow sales start, the game has since sold 1.2 million copies (I thought it was 1.6 million now, but couldn't find the article!). I tried to see how much a DJ charges per hour, and the average amount seems to be right around $200/hour. If Activision were making $200/hour off of Wii owners' DJ Hero game-play hours, they would have made $102,648,600 so far...I can see Bobby Kotick's eyes glazing over, if he reads that! As for the game-play data in general though, it's definitely not as high some Wii games released around the same time last year, but I think it's encouraging for a new IP. I think it will be interesting to see if DJ Hero 2 performs as well as the original. Did any of you purchase the original DJ Hero? If so, is it a game you would recommend to others? If you didn't purchase the original, do any of you plan on picking up DJ Hero 2? I have been tempted a few times to purchase the original when I have seen it go on sale, but I haven't done so yet. I've played it extensively at my cousin's house, but I already have enough plastic instruments in my living room and I cant bear to have any more. It's entertaining, but being a DJ isn't as fun for me as whacking stuff with my drum sticks. I have never purchased any of the music games with plastic accessories, though I have played Guitar Hero and Rock Band before. No but it was something I really wanted to check out, so I was very excited to hear about the $20 deal Toys R Us had on the game a few weeks ago. But my local TRU only had 2 player bundles (2 turntables and the game). A version of the game is coming to 3DS, so I'll probably just grab that on the 3DS instead. I really enjoyed being able to take Guitar Hero with me on the DS, and as far as I know, DJ Hero 3DS won't even use a peripheral. Yea, the Toys R Us deal was one that I thought about, but my money tree couldn't justify it at the time. I really wonder how many, if any, peripherals the 3DS will have like the Guitar Hero attachment...it's missing the GBA slot, so I don't know how well peripherals will work on the 3DS in that fashion.